We may get deep into politics here. Who wrote that? Anyway, I think the guy got it right. As for Taiwan/China, well, both governments claim to represent the entire country, and neither of them seems to be eager to resolve this issue militarily. So from a pragmatic point of view, we have two countries here - and each of them issues coins and notes that can be used for payments in the issuing country only. That is what primarily counts for me. There is a curious twist to the whole China vs. Taiwan conflict. Their leaders travel back and forth all the time on visits - so there is some effort at a form of reconciliation. Back in April 2006 we were visiting the Great Wall north of Beijing and suddenly the authorities asked us to leave the area and wait in a courtyard for awhile while the president of Taiwan toured the wall. I thought it was amazing, here these countries exchange verbal hostilities all the time, but the president of Taiwan takes a trip to Beijing on an unofficial visit. They recently just signed a trade pact that eliminates tariffs on goods traded between the two - a smart move in the right direction - economic success and profit trump politics any day. This Galapagos pseudo-set belongs in category 1], I believe. But which mint is responsible for it? I spotted the initials "JL" on a couple of enlarged images of these fantasies. Who could this designer be, I wondered? "The circulation issues were struck at the Roger Williams Mint in Massachusetts. The fish side (reverse) were designed by Laurel Rogers. Her initials LR appear in the design. The tree side (obverse) was designed by Joseph Lang." 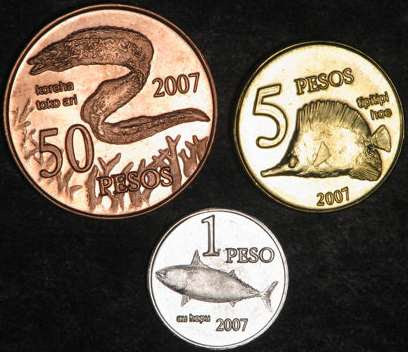 So could the designer of the Galapagos fantasy coins also be Mr Lang, and therefore is it possible they were also produced by the Roger Williams Mint? The likelihood is strong, I believe. 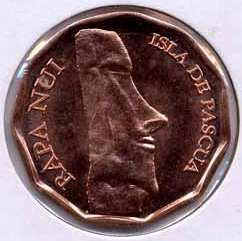 And I almost forgot the Easter Island fantasy coins, didn't I? Another category 1] type. Again, I don't know who minted them. roundabout 2002 there were coins produced in low value aluminium for North Korea, Democratic republic of the Congo, Somalia and Somaliland. I doubt any had legal tender status. 1] Unofficial sets for recognised territories or countries. 4] "Coin" sets for a part or parts of an existing recognised state, but which are either fighting for or desirous of self-determination. Probably a 1] - do Tatars REALLY want to be independent? This 2008 dated seven coin set from the Republic of Tatarstan features native wildlife. With the collapse, Tatarstan declared itself independent. After much political maneuvering, it became a Federal Republic within the Russian Federation, thus possessing a large degree of autonomy. 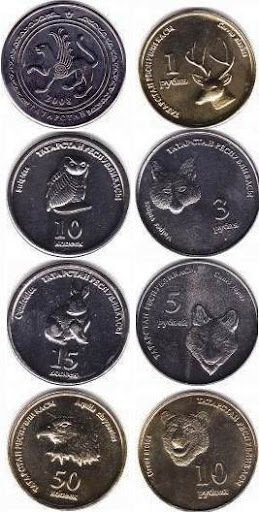 This unofficial set from the Republic of Tatarstan includes the 10 Kopecks picturing an owl, a 15 Kopecks with a rabbit, a Golden Eagle on the 50 Kopecks, a Red Deer on the 1 Ruble, a Red Fox on the 3 Rubles, a Gray Wolf on the 5 Rubles, and a bear on the 10 Rubles. The obverse of each coin features the stylized winged lion from the Tatarstan arms. Only 2000 sets were minted. The coins are Uncirculated, though are poorly struck. Republic of Tatarstan is a federal subject of the Russian Federation (a republic).